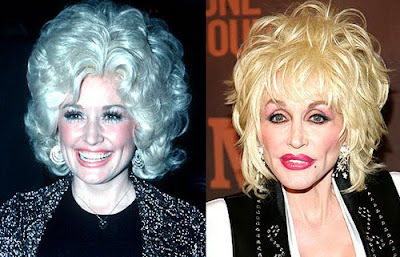 Dolly Parton before and after plastic surgery. Dolly Parton is very well known for her giant over sized breast implants, but instead of stating the obvious lets have a look at the facial plastic surgery procedures Dolly Parton has presumably underwent. There are two key areas of Dolly Parton's face which we can see a drastic alteration in the before and after photos, one being her exceeding narrow nose which looks to be the result of one or maybe even two separate nose jobs (Rhinoplasty). And i think it goes without mentioning that Dolly Parton's lips have taken on a life of their own, seemingly doubling in size over the years which can only be the result of lip injections or implants. Plastic surgery may have caused Dolly Parton to look like merely a shell of her former self, however her voice is still beautiful as ever. She is clearly not ugly. "There ain't nuthin' wrong with plastic surgery. Well, Dolly Parton never looked so good to me. Everybody ought to be exactly who they want to be." I think she looks fine. She was beautiful before the surgeries though. 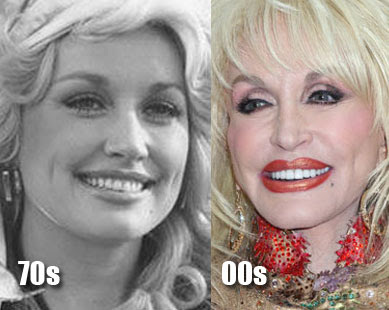 Dolly has admitted to having Plastic Surgery a million times and people still ask her, its strange. I don't like it when celebrities lie about not having plastic surgery but Dolly is happy with the way she looks, she describe sher self as "The town tramp"
Dolly looks like that puppet "Madam", of Whalen and Madam....LMAO!!! Dolly will always be hot, no matter what she does. Dolly is still hot. I Love you Dolly and GOD BLESS YOU ! Leave Dolly alone. She is an incredible singer, song writer and actress. A genuine lady. Don't hate on her simply because she is thinner than you. Leave Dolly alone. She is an amazing singer and actress. I applaud her honesty about her plastic surgery. Classy Lady. Dolly is great, both her music n her looks. Plastic or not, she's still great. She is a legend, well respected accross the world. I am in south africa n proud to say, "Dolly, u r fantastic"